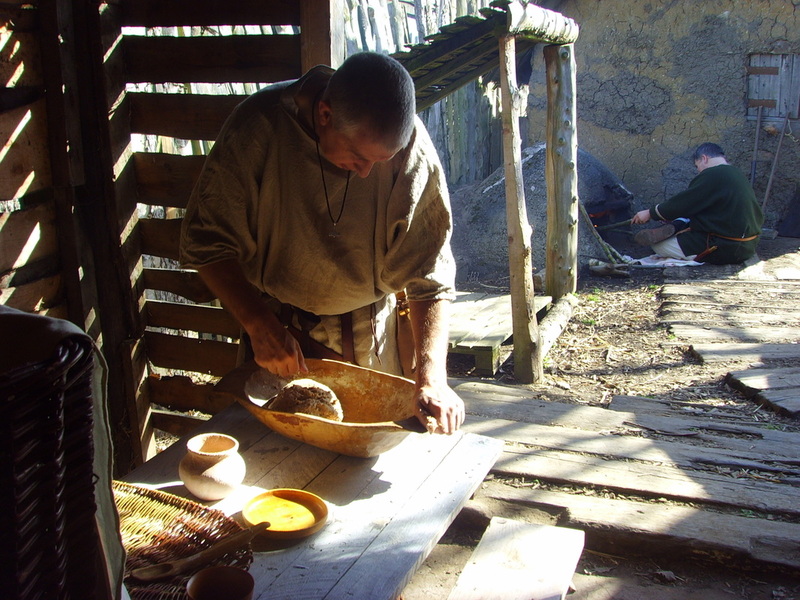 All of the Earlyworks members are avid ancient cooks, the attraction is obvious ... we get to eat the end results! 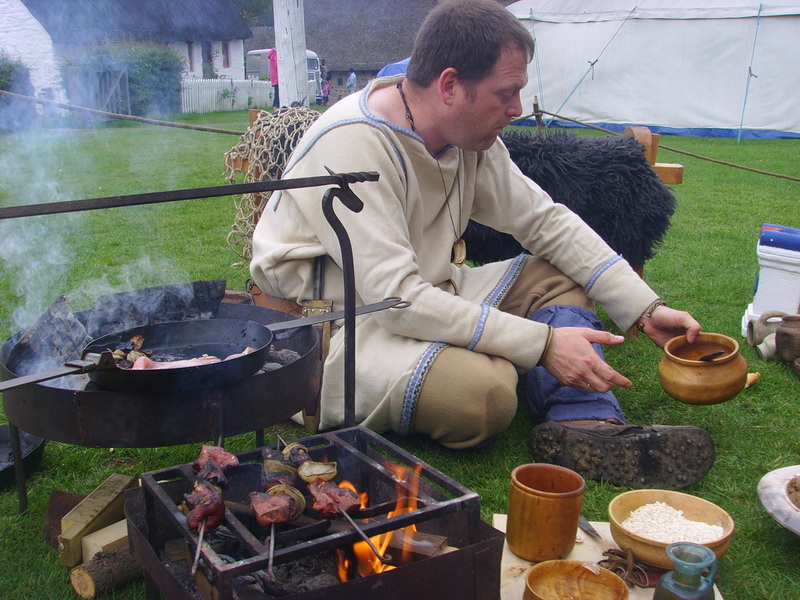 Our culinary experiments have ranged right across the historical spectrum, taking in beach-cooked limpets (Mesolithic-style), Iron Age pit cooking of pork joints, tasty dishes recommended by the Roman gourmet Apicius and Viking bread. Fry the bacon until the fat comes away from it and add the chopped leeks. Cook until tender. Add the fillets of fish and cover with the milk. 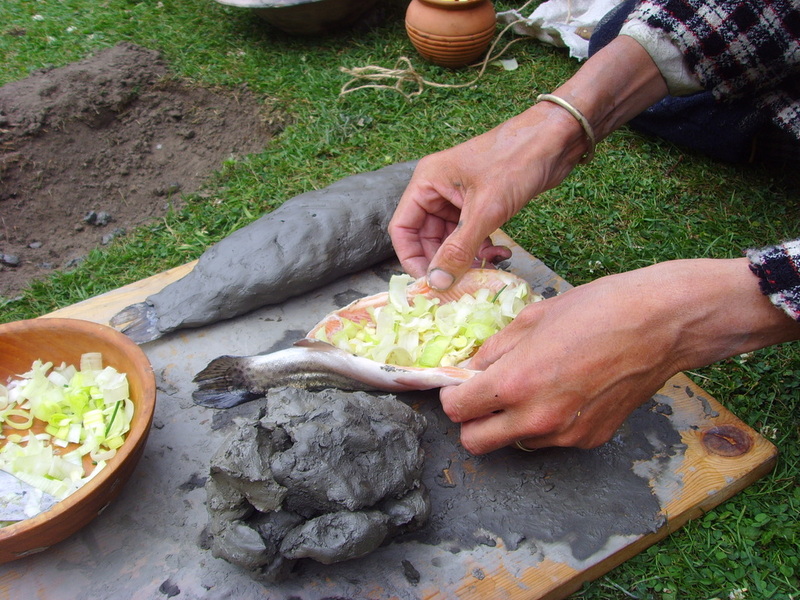 Slowly cook in a pot near the fire until the fish is cooked, which is about 30 minutes. Pour in the cream, along with the chopped chives and salt. 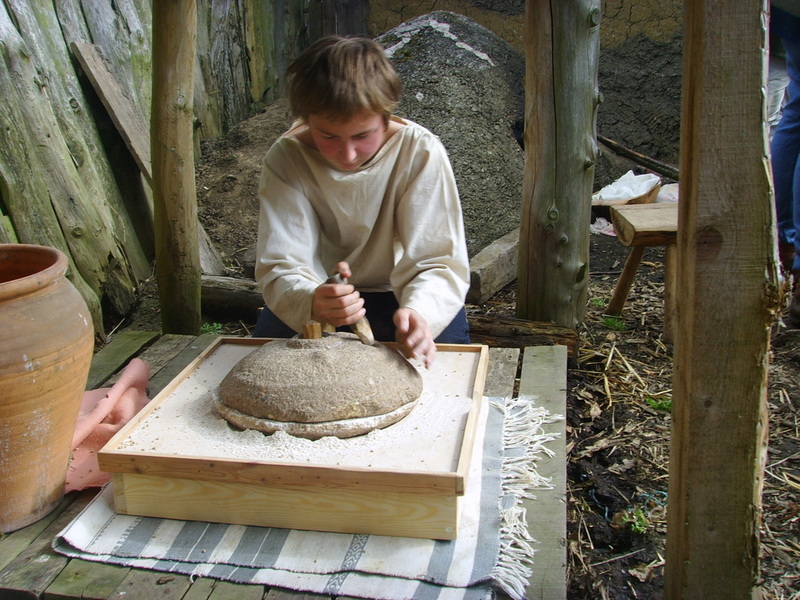 Among the fish remains found in prehistoric middens (waste pits) in northern Europe are: eel, carp, pike, perch, trout, salmon, plaice, bass, mullet, cod and spurdog. Mix the flours and salt together and rub in the butter. Add enough beer to make a soft dough and shape into small cakes. Cook on a hot stone (or griddle) until firm. This is a very light bread because of the addition of the beer and is good with cheese. Wash the lungs and heart. Place in large pan of cold water with the meat trimmings and bring to the boil. Cook for about 2 hours. When cooked, strain off the stock and set aside. Mince the lungs, heart and trimmings. Put the minced mixture in a bowl and add the finely chopped onions, oatmeal and seasoning. Mix well and add enough stock to moisten the mixture. It should have a soft crumbly consistency. Spoon the mixture into the sheep's stomach, so that it's just over half full. Sew up the stomach with strong thread and prick a couple of times so it doesn't explode while cooking. Put the haggis in a pan of boiling water (enough to cover it) and cook for 3 hours without a lid. Keep adding water to keep it covered. To serve, cut open the haggis and spoon out the filling. Chop the herbs and mix in the barley flour and salt. Add enough water to bind and place in the centre of a linen or muslin cloth. Tie the cloth and add to a pot of simmering venison or wild boar (a pork joint will do just as well). Leave in the pot until meat is cooked. When all the vegetables are cooked, add some porridge oats. If you want your pottage to be runny, like soup, add a couple of tablespoons of oats. If you want it to be extra thick and filling add a large cupful. Continue to simmer until the porridge is cooked. Adjust the seasoning and serve with bread and cheese.